FIND articulation words from the list on the right or FOLLOW the provided 2-step temporal (before, after) directions using the Summer scenes. The pack also includes a set of 20 WH-questions per scene and suggestions about other ways that the scenes can be used. 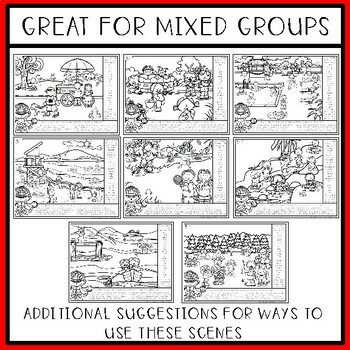 Great for mixed groups! Great for Teletherapy too! 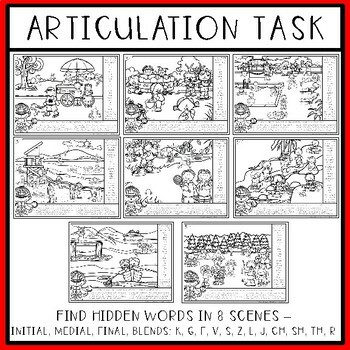 The articulation words are provided in the box on the right hand side and are hidden among the picture in small font. 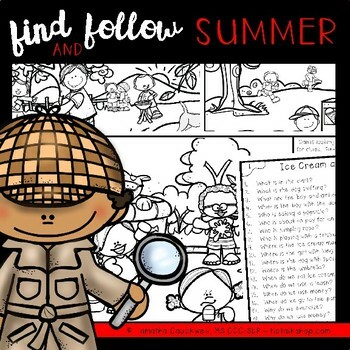 Kids enjoy looking for the words with a magnifying glass just like a super sleuth! If you are using for teletherapy, I have zoomed the page in a little so students are able to find the words but not so big that they are obvious. 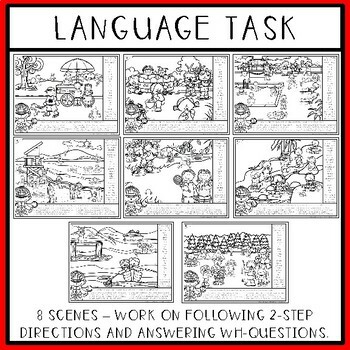 8 different scenes are available and targets the following: articulation (initial, medial, final, blends: k, g, f, v, s, z, l, j, ch, sh, th, r), following 2-step temporal directions, and responding to wh-questions. CLICK HERE to save 20% by buying Find Articulation and Follow Directions SEASONS and HOLIDAYS BUNDLE. With the seasonal and holiday sets found in this BUNDLE it makes it even easier to practice and work with mixed groups all year long! Don’t forget that leaving thoughtful feedback earns you credit towards FREE TPT purchases and helps me to better help you! I love and appreciate feedback! Be sure to follow me to be notified when new resources are posted.